Follow this link to read a 2007 decision in which Justin Lawrence successfully argued that his client, an employee of Consolidated Grain and Barge (CGB) qualified as a seaman under the law. Justin Lawrence also argued that W & M Kraft (corporation from South Carolina that provided safety consulting services to CGB) be held responsible for failing to make general safety recommendations in which would have protected Mr. Lawrence’s client at the time of accident. The client fell from a cell tower and onto a barge while working for CGB on the banks of the Ohio River. Just another reason why Lawrence & Associates is always Working Hard for the Working Class. Follow the link for more details. Am I Covered Under Ohio’s Workers’ Compensation Code? That the injury was accidental in character and result. Employers have the right to dispute any of these elements, and this can create complex legal obstacles for an injured worker to navigate. This is why it is important to find an attorney who can guide you through the Ohio worker’s compensation process to ensure your claim is allowed and you receive the benefits you are entitled to. How Could My Employer Challenge My Claim? Employers may assert that an injured worker is not in fact an employee. This challenge often comes into play in cases of independent contractors, temps, labor leasing and interns. Both statutory and case law are complex in this area, and the classification is not always cut and dry. Therefore, if you employer is claiming that you are not an employee, you should seek out an experienced attorney who can help you decipher if you are entitled to worker’s compensation benefits and who knows how to advocate for your rights. Employers might argue that an injury did not arise out of the employment. Common scenarios in which this argument might be raised are when there is a toxic exposure over a long period of time at a work place, when there is an injury resulting from a repetitive motion brought on by work places duties which did not have a specific onset date, or heart attacks that occur while on the workplace premises. While some of these instances may result in denial of a claim, the validity of such a claim should not be discounted automatically. Several details must be taken into consideration in each of these instances, and attention to various factors could mean the difference between a claim being allowed or denied. Ohio law states that employers are not permitted to pass blame on the injured worker for the workplace injury because Ohio is a no fault state. If an employer is asserting that a claim should not be allowed due to an injured workers lack of common sense, failure to follow work rules, inattention to details or other similar careless actions, that injured worker needs to find an Ohio attorney who is familiar with the Ohio no-fault system to advocate for their rights and prevent them from failing receive the benefits they deserve under such a no-fault system. Ohio worker’s compensation law is complex and the process of getting your Ohio worker’s compensation claim allowed can be difficult and stressful. Employers are only looking out for their own interests and have their own attorneys working to save them time and money. As an injured worker you need an experienced Ohio attorney in your corner to make sure you claim is not wrongfully denied. What Can You Do To Protect Your Workers’ Compensation Rights Under Ohio Law? The Ohio Bureau of Workers’ Claims has a handy handbook for injured workers that will outline many of your rights for you. There is also an ombudsman employed by the BWC that is tasked with attempting to resolve disputes related to the procedural requirements of filing a Workers’ Compensation claim. However, the only way to get true representation in this system is to hire an attorney, as referenced above. Attorneys are paid by contingency fee, so you do not have to spend money out of pocket, and attorneys have an ethical duty to represent you to the fullest of their ability. If you would like to speak to an attorney about the specifics of your claim, call Lawrence & Associates today for a free consultation. We’re Working Hard for the Working Class, and we can help you! Lawrence & Associates Help a Client Offered Too Little By Her Workers’ Comp Carrier Get a Settlement for 10 times More! Everyday employees are injured while on the job and everyday employers and insurance companies try to deny those injuries have happened on the job because they are trying to minimize the value of claims. Our goal is to help our clients get the medical care they need to recover as much as possible. We want to share a recent case we handled to give you an idea of what we can do for our clients. We will supply as many details as possible while still respecting our clients need for privacy. Our client from Dry Ridge, Kentucky went through an entire Workers’ Compensation claim with no problems. The adjuster was nice, the TTD checks came on time, and all the medical bills were paid. Everything went well until the end, when the Comp carrier offered a tiny amount to settle her claim. Our client realized something wasn’t right and called Lawrence & Associates to see if she was getting a fair shake on her settlement. Lawrence & Associates analyzed the claim and quickly realized that our client deserved far more to settle her Whole Person Impairment than the carrier was willing to give. We took on the case and assembled irrefutable proof that our client was owed far more than had been offered. Lawrence & Associates have handled all types of workers’ compensation cases. Lawrence & Associates will work to build a strong and successful case for you. Common Types of Work Injuries…. If you lost a loved one in a work accident, we may be able to help you obtain survivor’s benefits. We know that there is simply no amount of money that can replace your loss, but we will work hard to get you the resources you need to make ends meet and begin moving forward in life. Our client is a prisoner in the Kentucky state prison system. Shortly before he was incarcerated (for unrelated charges), he was injured at his work in Covington, Kentucky when a box fell from a high shelf and struck his shoulder. The Workers’ Compensation Carrier refused to provide medical treatment or Temporary Total Disability because it claimed our client, as a prisoner, was a ward of the prison system and would have to get treatment and other benefits that way. Unfortunately, the prison system also denied responsibility and client was left without medical care. 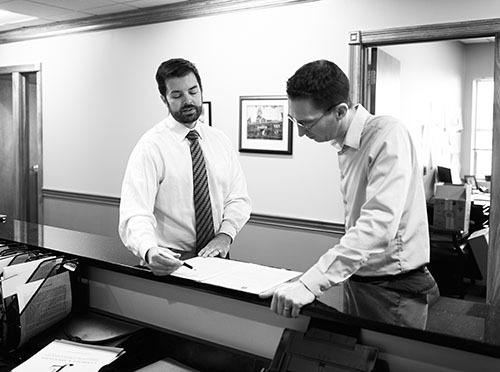 At Lawrence & Associates, we believe everyone has rights under the laws of the Commonwealth of Kentucky. It did not matter that our client was a prisoner. We took his claim and filed it, proving to the Administrative Law Judge that our client required surgery related to his workplace injury. Not only did we get surgery approved, but we also made the Workers’ Compensation carrier pay Temporary Total Disability (TTD) to our client while he was incarcerated. Our client is currently undergoing physical therapy and sending his TTD checks home to his wife and children. Our client injured his back and neck lifting heavy equipment while working for his employer in Florence, Kentucky. Because he had a neck injury years beforehand, his employer denied all his treatment and refused to pay him Temporary Total Disability (TTD). He became desperate, unable to pay for his medical bills and unable to get treatment, although his doctor was recommending an immediate surgery. He also had no income, and his wife’s income alone was not enough to support their family. Lawrence & Associates filed our client’s claim and asked the Administrative Law Judge for an immediate hearing to determine whether our client was entitled to have the employer’s Workers’ Compensation carrier pay for his medical bills, and whether our client was entitled to TTD payments. It was crucial that we get our client’s claim decided immediately because he was in dire straits and was thinking of filing bankruptcy so his home wouldn’t be foreclosed on. Lawrence & Associates won the claim and got our client the treatment he needed. He is still treating today and hopes to make a full recovery. Also, we forced the employer’s Workers’ Compensation carrier to pay back all of the TTD that our client should have been paid from the date he was first injured, and he was able to use that money to pay off or catch up the debts that had been troubling him. Our client worked for a Northern Kentucky cable installation company. One day, while installing cable, he felt a pop in his shoulder. That pop was an injury to his nervous system caused by physical exertion. As a result of the injury, our client developed Complex Regional Pain Syndrome, Type 1, also known as Reflex Sympathetic Dystrophy. This debilitating condition caused our client to be unable to use his arm, and caused the arm to be extremely painful to the touch. Despite being diagnosed by both his treating doctor and the company’s doctor, our client could not get the company to provide full benefits for him. Lawrence & Associates filed our client’s claim with the Kentucky Department of Workers’ Claims right away. We have a lot of experience with CRPS sufferers, and we knew that this type of claim does not get a good result without providing a great deal of proof for the Administrative Law Judge and company to consider. Our attorneys needed to dig through every medical record and interview every witness to prove our client’s injury was work related. Further, because CRPS is so debilitating, we knew we would have to prove permanent impairment so our client had steady income to live off of until he reaches social security retirement age. We reached a settlement with the company’s carrier for over $500,000, which was divided into money used to replace our client’s lost wages and money used to pay for our client’s future medical needs. This settlement allowed our client to pay off all of his family’s outstanding debts, including their mortgage, so they could live on a single family income. It also insured that our client would get the medical treatment he needs to live a happier, and more relatively pain free life. If you have a workers’ compensation claim and your gut is telling you that someone may be following you….your gut may be correct. Many insurance companies employ private investigators to find evidence that a claimant is healthy enough to return to work or that a claimant is earning income while collecting workers’ compensation benefits. However, with the increased use of social media, insurance companies may not need to physically follow a claimant in order to discover damaging information. With the increased use of social media, claimant’s need to be aware that what they post on Facebook, MySpace, LinkedIn, Twitter, etc. may potentially damage their workers’ compensation claim. In some cases, insurers are asking for the passwords to their claimants’ private Facebook accounts. Although this seems like an obvious privacy violation, in 2010, the New York Supreme Court dealt with this exact issue. The employer served the claimant with a notice for discovery requesting full access to current and deleted records on her Facebook and MySpace pages. Romano v. Steelcase Inc., 30 Misc. 3d 426, 907 N.Y.S.2d 650 (Sup. Ct. 2010). The claimant refused to give the authorizations, and the employer responded by filing a Motion to Compel with the Court. The employer supported their Motion with the claimant’s public content, which contained photos of the claimant smiling happily outside her home despite her claim of being confined to her house and bed. The claimant argued that the request and Motion violated her privacy rights. Social Media – With social media, you have control of your privacy settings. Make sure you use these privacy settings on all of your social media accounts so only friends, family and people you choose can see your posted content. Also, only friend people you know on a personal level and don’t post pictures and statuses that you aren’t comfortable with the entire world seeing. Private Property – Private Investigators can legally film you; however, they are not supposed to go onto private property. PIs Must Speak with Counsel – If you are represented by counsel, a private investigator cannot ethically talk to you. Report/Video Rights – The investigators report or video cannot be sent to a doctor without your consent. Although this is the law, many insurance companies routinely break the law. The investigators report may skew the facts or be a flat out lie. We have seen a case where a private investigator filmed a mother picking her child up when exiting a vehicle. While picking your child up from their car seat is a necessity in life, in this case the claimant had a lifting restriction of 10 pounds. Based on the video footage alone, the insurance company cut off all of the claimant’s workers’ compensation benefits. The insurance company also sent the video footage to the claimant’s doctor who lifted all of the claimant’s restrictions. If you feel uncomfortable with the amount or type of information being requested by your employer or their insurer, consult a Northern Kentucky Workers’ Compensation Attorney.